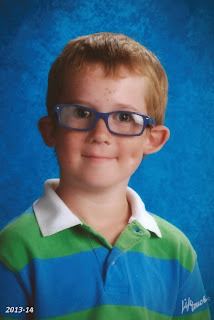 Now we have all of our kids' 2013-2014 school year pictures with the arrival of Orion's prints yesterday! Skyler and Anastasia got great pictures the first time around and didn't need to go back for a retake. Orion, however, had different plans! He was sleeping on the first day and he would not wake up despite my efforts. The day before retake, I made sure to trim down Orion's snowy white hair but I forgot to put his scleral shell back in his right eye. I drove to TSD in the morning realizing that and it's still sitting in a baggie at home. Luckily, Thomas found it for me and met me at school. I did my magic, putting it in at the library where the retake photo shoots were. Orion was upset but onward we went. It was my goal for this year's school photo that he sits independently. I've enjoyed having to have me in the picture, holding him on my lap, during the previous years but this is the year he sits by himself. We set him down on the stepped sitting block. He was startled by this new thing he's been put upon, having to sit up by himself, and he might've been very uncertain about his surroundings. His intervener and I tried different things, including using books to create a breeze, to get him to smile. He was not having any of it. His head was tilted down and he was fussing professionally. Thankfully the Lifetouch photographer was understanding and offered to try again if we brought him in later. At the end of his school morning, Orion, his intervener and I went back to the library to try again. What's different this time was that Orion was calmer and settled down; he had a nice morning with his intervener (highlight: he walked in the shallow pool water with her! ); the shell has been in his eye for 3 hours; and he's sat on this stepped block before (Hello, "experience"!) He fussed, we got right to work… his intervener created a book breeze, I started massaging his little piggies out of frame. Soon his stern face was brightened by a smile and that when this precious photo was taken! Hallelujah! We did it!! I felt like we won a game show from behind. If any of you watch Family Feud's Fast Cash, that's the feeling! Yay, Orion! Oh, right, and he was sitting by himself, too. 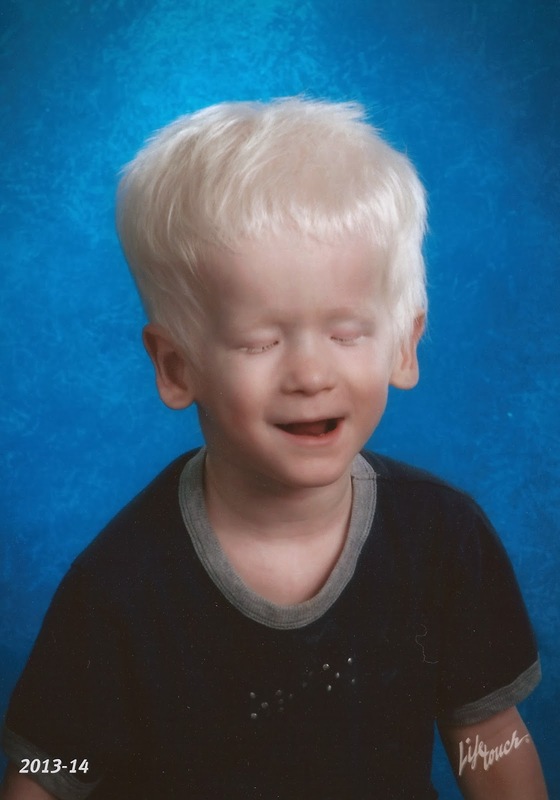 At 3 years of age, Orion Withrow sat alone for his school picture. My thoughts take me to this: Thank you for doing this for us, Orion! I'm sure there are situations (that I can't think of) where a photo may be important to a blind person but it's certainly special for family and friends. I need to figure out how to make posing for pictures special for him, and the special results are for us. 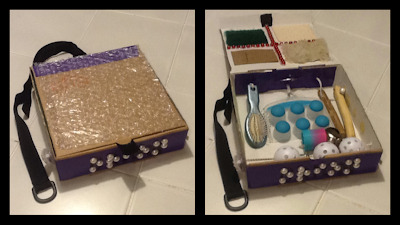 I'm curious if anyone out there has ideas that turned out great for blind/deafblind kids. 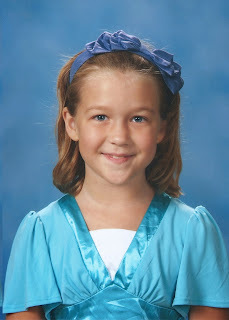 2011-2012 school year in Maryland: Skyler (2nd grade) and Orion (PIP) at Kendall School (Washington, DC); Anastasia (Kindergarten) at Glenn Dale Elementary. This is the 99th post on 'A Mom's Musings'! Now I can sing, "Ninety-nine posts on my blog, someone hacked it and deleted a post. Now there's ninety-eight posts on my blog, someone hacked it and…"
Anyway, back down off the wall I go and in the computer chair I sit! 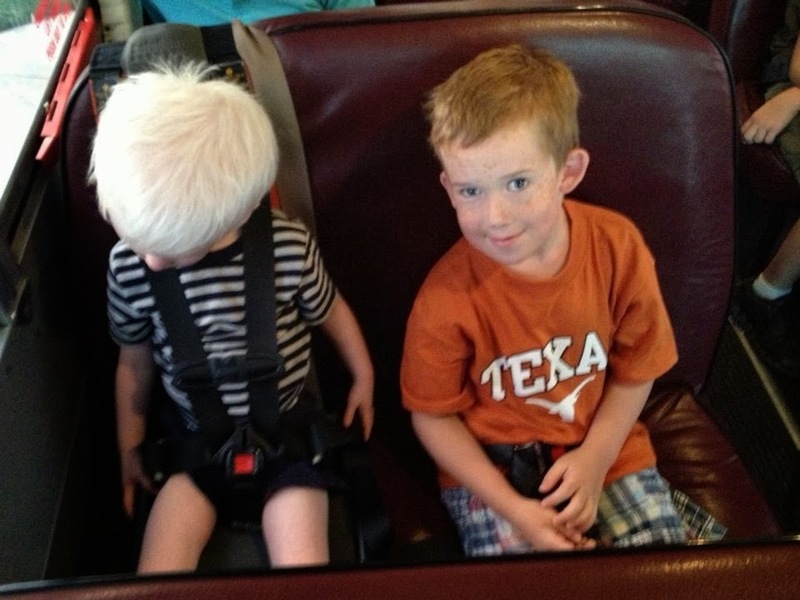 Orion's first school bus ride to his second day at Texas School for the Deaf along with big brother Skyler. I'll get right to the point here, Orion is doing really well while riding the TSD bus to school from home. Yes, he's riding the bus! I didn't even imagine it at this time last year. Kids who go to PIP (now called TLC, Toddler Learning Center) at TSD can ride the bus. Some do and some are chauffeured by their parents. Last year, I brought Orion to and from TSD 3 times a week (he started out at TSD 2 times a week). It got old but Orion is worth it and I got to see his teacher work with him as well as witness the other cute little Deaf toddlers learn. Knowing Orion was going to be in school 5 days a week for the 2013-14 school year and that his big brother Skyler would ride along with him, we had to give bus transportation a try! We also decided that since flexibility with time is important for Orion and his teacher or Intervener at the end of the morning we would come and pick him up from the TLC house every day. It turned out that Orion cried during the ride. I think he cried some of the way each morning he rode the bus throughout September. Orion's Fun in a Box, made by yours truly. 8/28/2013. Photos edited in InstaPic Frame. Meanwhile, I made a "Fun in a Box" for Orion; we enlisted the comfort of his hole-y crocheted blanket from Gramma (he loves holes); and encouraged Skyler to just be there for Orion even if he doesn't calm down with his touch. I was really concerned for his emotional well-being but better reports were coming in about Orion as the month went along. We got a nice report from another student on the bus (we worried, we asked!) that even though Orion was crying, he's still improving and Skyler was so good with Orion and was doing a great job comforting him. So that was a relief and we were proud of Skyler. It also helped that we were the last stop on the route before they boomeranged back to school. There were a couple instances where Orion would hold himself in a rigid plank, refusing to fold and sit in the seat. If coaxing or trying to tactile sign "SIT" didn't work (it worked sometimes!) we would drive him in. It took a while for Orion to get used to it. What an odd experience! Odd seat! Not a typical car booster seat but a 5-point harness practically coming out of the bus seat itself, no headrest, sides, etc. The driver shared with me that Orion only starts crying when the bus is stopped (at the light, in heavy traffic) but is fine while it's moving. Whenever we knew Skyler would not be on the bus, we would not put Orion on the bus alone so instead we drove Orion to school. So like you already knew from the beginning, he's gotten used to the bus rides and is doing so much better. 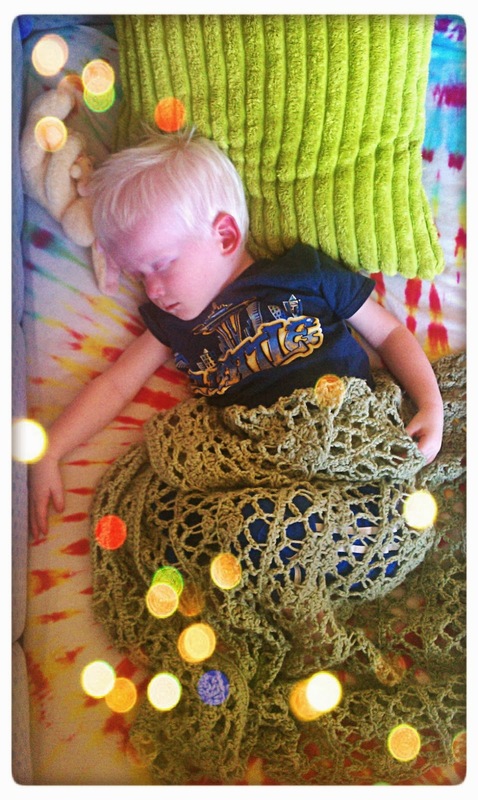 Orion naps with the hole-y blanket Gramma made for him. 11/2/2013. Feeling It: Orion is Eavesdropping! © 2009-2016, Heather L. Withrow. Awesome Inc. theme. Theme images by lishenjun. Powered by Blogger.